Getting into the weeds of operating systems is daunting work. Especially when the operating system involved is a fully featured modern PC operating system with millions of lines of code all working together to integrate hardware and software seamlessly. One such operating system “weed” is figuring out how to handle simultaneous tasks when the processor can only really handle one thing at time. For that, you’ll be looking at the difference between spinlocks and mutexes. Both of these are methods of making sure that the processor completes a task sufficiently before moving on to the next task. Modern computers are so fast (even ignoring multiple cores) that it seems as if they are doing many things at once. In order to maintain this illusion, tasks need ways of locking the processor to that specific task for a certain amount of time. Of course the queue for performing the next task can get complicated as there are often many tasks waiting to use processor time. Spinlocks are a simple way of holding the processor and mutexes are a slightly more complicated way, but which one is the most efficient use of system resources isn’t that straightforward. If you’ve ever been interested in operating system details, this one goes deep into the intricacies of features most of us have never even considered the existence of. It’s definitely worth a read, though, and is very well written by someone who is clearly an expert. If you want an operating system challenge, you can build your own operating system as well. We’re quite used to multitasking computer systems today. Our desktops run email, a couple of browsers in different workspaces, a word processor, and a few other applications, apparently all at once. Looking behind the scenes using a system monitor or task manager program reveals a multitude of other programs running in support of our activities. Of course, any given CPU is running a maximum of one program at a time. Multitasking is simply the practice of switching between active processes fast enough to give the illusion of simultaneity. The roots of multiasking go way back. In the early days, when computers cost tons of money, the thought of an idle system was anathema. Teletype IO was slow compared to the processor, and leaving the processor waiting idle for a card reader to slurp in the next card was outrageous. The gurus of the time worked to fill that idle time with productive work. That eventually led to systems that would run multiple programs at one time, and eventually to more finely grained multitasking within a program. Modern multitasking depends on support from the underlying API of an operating system. Each OS uses its own techniques, making it difficult to write portable code. The C++ 2011 standard increased the portability of the language by adding concurrency routines to the Standard Template Library (STL). These routines use the API of the OS. For instance, the Linux version uses the POSIX threading library, pthread. The result is a minimal, but useful, capability for building upon in later standards. The C++ 2017 standard development activities include work on parallelism and concurrency. In this article, I’ll work through some of the facilities for and pitfalls in writing threaded code in C++. [vinod] wanted to familiarize himself with AVR assembly programming, but wanted to do something a little more ambitious than simply blinking an LED. While the completed build does blink a few LEDs, we love that e decided to implement multitasking on his microcontroller. The program [vinod] came up with uses round robin scheduling to give one of the seven programmed tasks a little bit of compute time every time a timer is triggered. Although it’s extremely simple compared to “real-life” real-time operating systems like VxWorks, it’s still an impressive achievement. In the video after the break, [vinod] shows off his task-switching with seven LEDs. The white LED is a PWM task, while the six other LEDs are simple toggling tasks that switch a LED on and off at set intervals independent of each other. This would be hard – if not impossible – to do without some sort of scheduling. Nice work, [vinod]. So you’re getting better at programming microcontrollers and now you want to do several things at once? You know better than that, microcontrollers are only capable of processing one thing at a time. But if you’re clever with your coding you can achieve something that behaves as if several things are going on at once. The most common way to do this is to set a flag using an interrupt, then use the main loop to check for that flag. [S1axter] posted a tutorial on this topic where he uses bit field structures to help simplify time sensitive events. We think [S1axter] did a fantastic job of explaining this moderately difficult topic clearly and quickly. In the video after the break he begins by explaining what a bit field is and how it is defined. 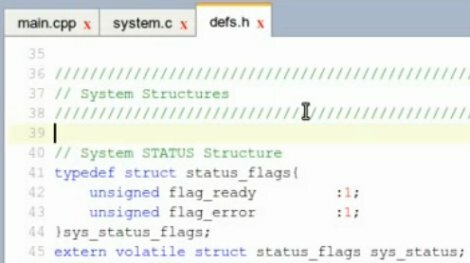 Basically you’re using a C structure to track a flag using just one bit of storage. This way the flag is either set or not. We suggest you pay careful attention to how he declares the structures as volatile, so you don’t have unexpected behavior when you try it yourself.